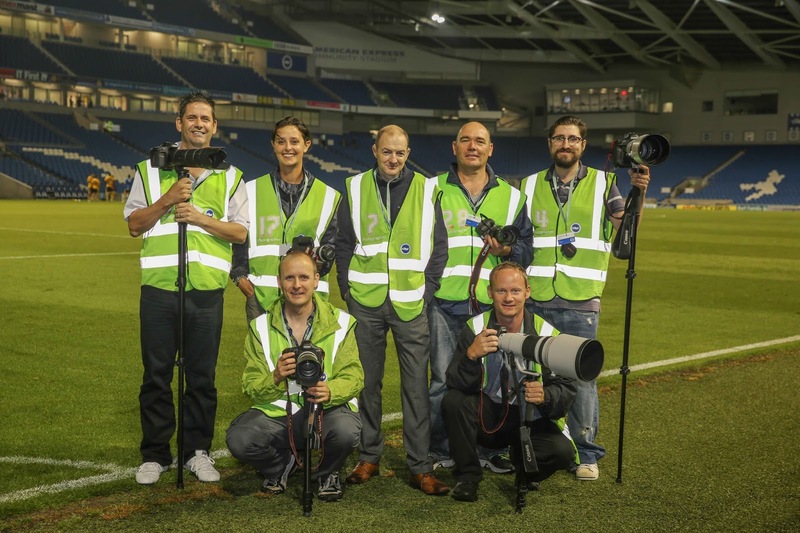 On Saturday 27th July 2013, Anthony Sinfield (Head Tutor of the Park Cameras ‘School of Photography’) conducted a unique photographic master class at the fabulous American Express Community Stadium, home to Brighton & Hove Albion Football Club. 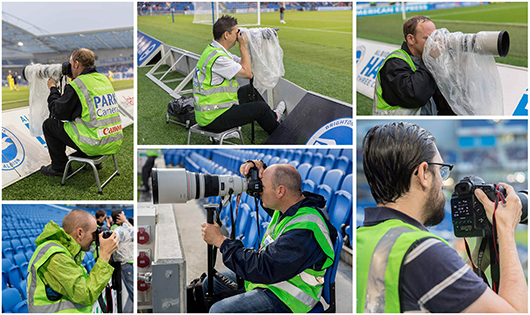 Participants of the course had the unique opportunity to photograph a friendly match against Spanish team Villarreal from the unique perspective of the touch line. Read on, as Anthony shares his review and insight from the day. Our base for the day was the TV studio suite, which is used by various TV corporations to film matches and offers a impressive and commanding view of the both the stadium and pitch. After taking in the impressive view we settled down to lunch supplied courtesy of Piglets Pantry who are recent winners of the British Pie awards and are a favourite with football fans. This was followed by a tour of the stadium which included the changing rooms, all set out ready for the players, hospitality suites and all areas of the stands. 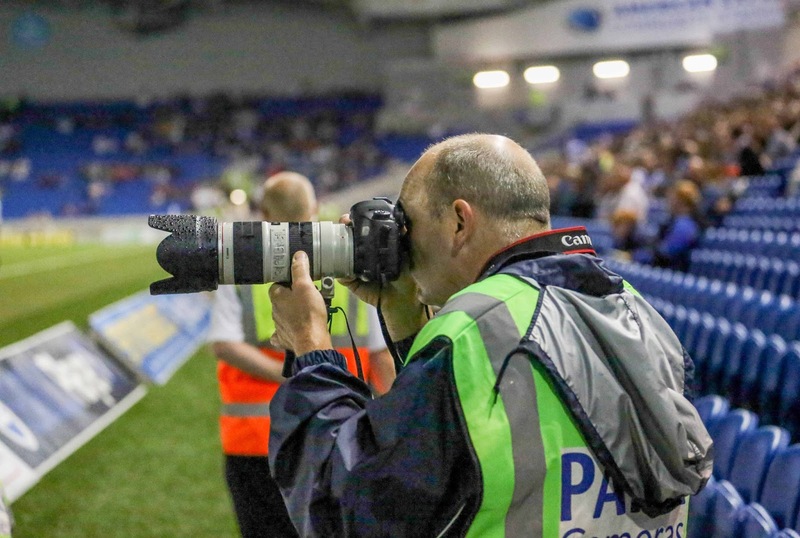 Following this we returned to the Sky suite for a presentation by the club photographer Paul Hazlewood who did a fantastic job in imparting his knowledge, thus ensuring everyone would be able to capture great shots. This was then followed by a session of how to set up the Canon EOS-1D X and EOS 5D Mark III cameras in terms of focus, exposure and ISO settings. We then moved on to the press centre where all the delegates were issued with official press passes for the game and a stool to use during the match. After further refreshments and time for a quick check of camera settings and equipment we left for the pitch. Being the first on the pitch allowed us to choose our positions and check and tweak settings for the impending action. From the moment the whistle was blown Brighton were on the attack and set the precedence for what was an exhilarating game. Blazing sunshine soon gave way to heavy showers and the occasionally flash of lightning; all this added to the atmosphere of the game and also resulted in some dramatic results. 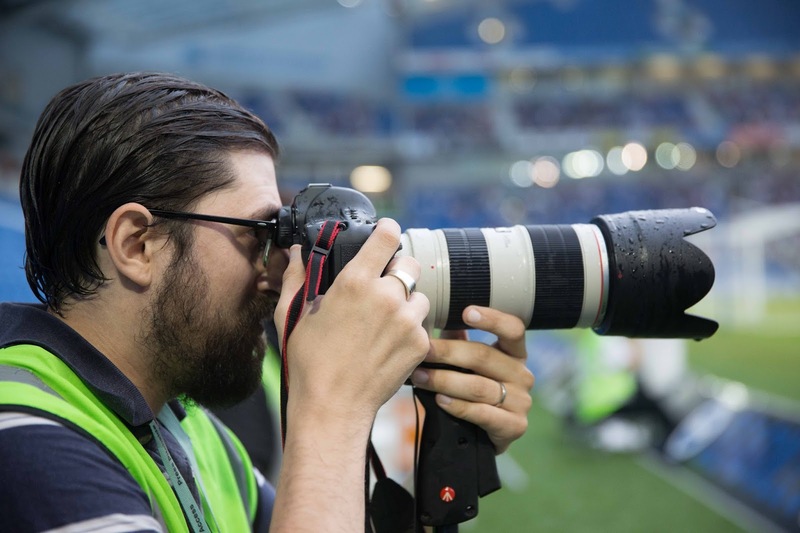 Throughout the game all the delegates were able to try out loan equipment kindly supplied by Canon including the EOS-1D X and EOS 5D Mark III cameras and the EF 300mm f/2.8L USM IS II and EF 400mm f/2.8L USM IS II lenses. 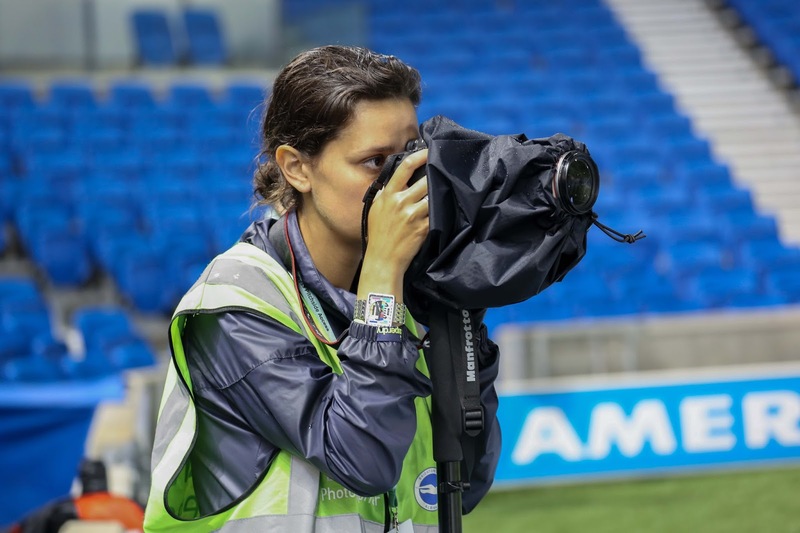 My colleague and I spent the duration of the game assisting and answering any technical queries, which included recommendation of changing ISO settings with the changing lighting conditions. From a personal / photographers point of view (and somewhat selfish) we were unable to use any of the equipment ourselves or capture any of the dramatic action, it was however fulfilling seeing the images captured by the delegates on the rear of the cameras, after all that was the purpose of the day for our delegates to capture stunning shots. 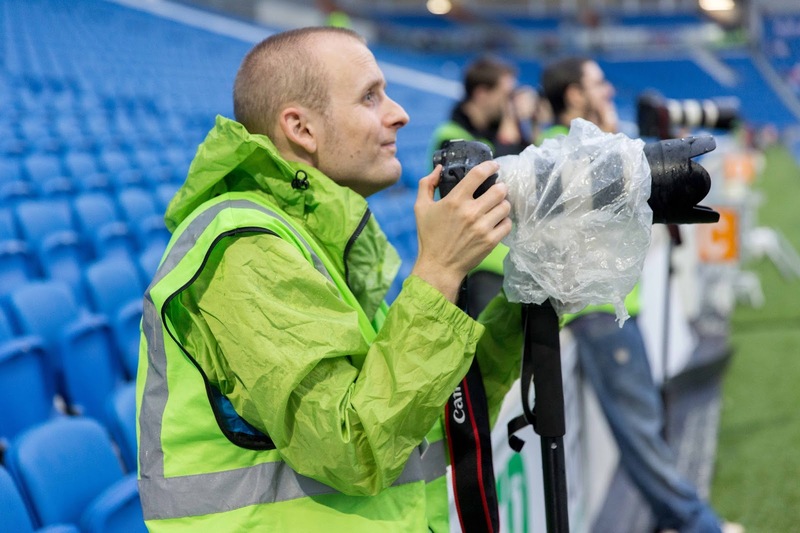 It is far to say the equipment fared better than we did because of the constant downpour and did not miss a bit regardless of being soaking wet. The second half sailed past as quickly as the first and before we knew it the final whistle was blown which meant the end of our time photographing the game. Group pictures on the pitch finalised what was a fantastic day it was, with all delegates commenting that it exceeded all expectations. All in all a unique experience which we hope to repeat next season, so watch this space for forthcoming dates. A selection of the photos taken by the delegates attending this course can be seen at www.Facebook.com/ParkCameras. You along with Paul and the stadium staff made for a very special day, one of the best photographic events I have attended. Paul. Park Cameras are proud to be one of only a handful of Canon Professional Imaging Partners. As such Park Cameras offer unparalleled customer service and support, dealing in full UK warranty Canon EOS cameras and lenses and NEVER imported (grey import) items from abroad with reduced warranty. At the time of writing, the EOS-1D X, EOS 5D Mark III, EF 300mm f/2.8L USM IS II and EF 400mm f/2.8L USM IS II lenses are all in stock at competitive prices. Visit Park Cameras at our showroom in Burgess Hill, West Sussex, or call us on 01444 23 70 70 and speak to one of our technical advisors.